In 1995, at the ripe old age of 14, my family took a cross-country road trip from one coast all the way to the other. One of the destinations was Washtington, D.C., where we made an entire day out of visiting the Smithsonian's Air and Space Museum. Being a family of science and space nerds, we easily could have spent several days exporing the exibits and learning all that it had to teach. With a love of movies already growing within me, the highlight was seeing my first IMAX film. Shot entirely on 70 mm celludoid, 'Destiny in Space' completely filled the monstrous screen with 40 minutes of shot-in-space footage that made me feel like I was really there. With the focus showing astronauts repair the Hubble telescope, the experience was literally dizzing. Although Hollywood has taken over the IMAX name and somewhat bastardized its power, there are still some studios that effectively use it in the same way that 'Destiny in Space' worked. Although I wasn't able to see National Geographic's 'Living in the Age of Airplanes' on an IMAX screen, after watching the gorgeous Blu-ray, I'm certain that it would have warranted the same immersive visual experience that 'Destiny in Space' did. Narrated by real-life pilot Harrison Ford, 'Living in the Age of Airplanes' is a brilliantly composed love letter to avaition that's broken into five parts. Before the first chapter, an introduction explains the way that aviation is perceived in modern times. It notes the hassles, the delays and all of the other nuissances that come with airline travel. Collectively, they make aviation – the most amazing form of transportation – something that's highly griped about and frustrating. Following the brief intro, we start the first chapter: "The World Before the Airplane." This segment analyzes human travel in great detail, showing how the average speed of travel has increased over Earth's lifespan. As we walk through the industrial revolution bits, we're shown lots of aged, grainy and flawed black & white archival footage – but once this accelerated history lesson catches us up to modern times, we're intoduced to the jaw-dropping, crystal clear footage that would make an IMAX viewing all the more impressive. From there out, the immersive visuals never cease. Parts two through four – titled "The Portal to the Planet," "Redefining Remote," and 'The World Comes to Us" – show the impact that aviation has on mankind. The world once seemed like such a huge place with countless unreachable places, but Earth is now quite a bit smaller. Thanks to modern aviation, without even knowing it, more now than ever, we're connected with more people, places and things from around the globe. One fantastic segment follows a perishable product from a distant country as it travels via FedEx airplanes all the way around the globe in just a few dozen hours. It's topped with a creative single-take view of an average home that shows the country of origin for many household products. Unbeknownst to most of us, we're all connected through aviation (amongst other forms of mass product shipping). The final chapter is a magical one. Titled "Perspective," it causes us to re-think our feelings about aviation. 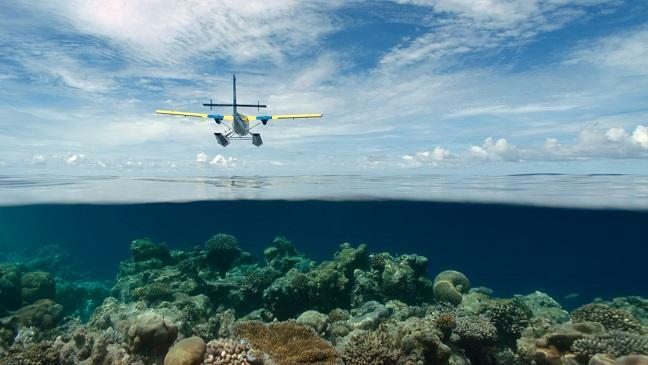 The travels hassles and worry are non-issues when you consider what an amazing feat flying is. Like an adventurous kid traveling on an airplane for the first time, it adds the wonder back into flying. The impact of this well-constructed conclusion will have you looking into the sky once again and anticipating the next time that you will get to take flight. It will make this, the fastest and most efficient mode of transportation, impressive again. National Geographic has placed 'Living in the Age of Airplanes' on a Region-free BD-25 that's housed in a no-name blue keepcase that's quite sturdy. A small booklet is included that features a scene guide, special feature list and credits. A slick, visually pleasing cardboard slip cover also comes with it. Upon popping the disc into your player, following an unskippable FBI warning, the only pre-menu video to play is a trailer for another gorgeous-looking documentary titled 'One Six Right: The Romance of Flying.' Set to a few minutes of footage from the film and beautiful score from the late James Horner, the main menu is mesmerizing. 'Living in the Age of Airplanes' comes with a stellar 1080p/AVC MPEG-4 encode. Although shot on a single high-res Arri Alexa digital camera (there's a special feature dedicated to their camera), the film was theatrically presented via 70 mm and 65 mm celluloid prints. The quality of the Blu-ray is so sharp that, unless you have a superbly trained eye for it, you'd never know that it wasn't shot on 70 mm IMAX film stock. Aside from the flawed, old archival black & white footage (which is presented in smaller section of the center for the frame with black borders all around it), everything in this film is gorgeous. The style and high quality imagery is like that delivered time and time again by the 'Planet Earth' folks. It's sharp, crisp and wildly rich in detail. Close-up shots of unsheathed jet engines are so finely detailed that they almost appear to be fake. Nothing can look that fine, can it? The detail in which complex imagery is shown is immaculate. In addition, shots from plane-mounted cameras have a seemingly 3D quality to the them. As we soar 50 feet above the Savannah, the imagery is anything but flat. Blue skies, pastel sunsets, lush greenery and bustling vibrant terminals – all feature some the most vivid colors I've seen in one disc. With brilliant colorization that spans the entire spectrum, this is one magnificent disc to behold. The only flaw that I could find within it (which is what keeps this from being a flawless five-star disc) is a single instance of bands that can be found in the bright forward-facing lights of airplanes on approach for night landings. That's it. Aside from that, this is reference quality video. 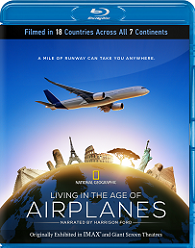 'Living in the Age of Airplanes' comes with a well-rounded 7.1 DTS-HD Master Audio track that sets the perfect soundstage for the film. All three elements - dialog, effects and music - work together harmoniously to make for a delightful listening experience. Harrison Ford's voice-over narration contains the likeness of David Attenborough's 'Planet Eath' narrations, only with a little lest dynamic range and inflection. As you'd expect, it's clean, clear and certally located. When warranted, the effects mixing is also what you'd hope for. Engines roar with, seemingly, dozens of smaller sounds composing the grander singular sound. Within the engine sounds, you'll hear the spinning, the pressure, the rushing air. As passing planes buzz the camera, you'll hear the engines seamlessly image around the space. One excellent nature shot unexpectedly features a fast plane quickly zooming into the sound arena, smoothly transitioning from the back, then overhead, and then in the front as it enters the frame. The special features menu is broken into three parts. The title of each describes the content within. Where each is listed, the runtime of that feature is shown; however, not all of the runtimes shown are accurate. The worst offender runs more than three minutes shorter than the advertised runtime. Alaska Flying (HD, 2:42) – Watch a narration-free collection of additional gorgeous footage that includes glacial fly-bys, Denali, aquatic take-offs and rocky landings. Plane Spotting (HD, 2:18) – Shot on five different continents, this narration-free collection of B-roll footage contains highlights of some of the best take-off, landing and in-flight footage captured. Flight Over Africa (HD, 4:56) – For cinephials, this featurette is great. While shooting in Africa, the director spotted a bi-plane that matched that from the film 'Out of Africa.' When he inquired of where the film's bi-plane sequence was shot, he learned that all locations were no more than 20 minutes (by plane) in any direction, so he hired the bi-plane owner to fly over those locations so he could recreate some of the film's most iconic shots – all for the love of the film and aviation. 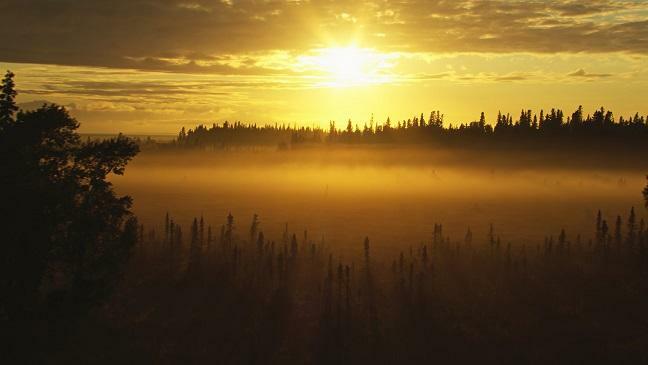 Alaska Flying II (HD, 2:42) – This video is a variant of the first special feature listed in this category. Most of the camera footage is identical, but instead of being narrator-less, it contains the live radio chat and over-the-air direction given to the pilots. Hawaii (Deleted Scene) (HD, 2:53) – Featuring narration from Harrison Ford, this complete sequence was excised from the final cut. It shows the densly populated cities, the timeless wilderness, the active beaches and mountaintop observatories of the Hawaiian islands. Impossible Shots: Visual Effects (HD, 12:16) – Only two sequences in the entire film required the use of VFX. While the filmmakers strived to make this a completely practical film, two sequences – one from space and one that removes the human infrastructure from nature – had to be faked. This in-depth feature takes you through the meticulous process used to make these CG-enhanced shots perfectly fit into the 99.9% reality-based film. 3 Stories in 4 Minutes (HD, 4:00) – This feature highlights three great aspects of the film in a promotional way – only without feeling like a generic EPK video. The first explains how the film was six years in the making, shot at 95 locations across 18 countries, and resulted in 260 hours of footage captured with one camera. The second includes a gorgeous sequence from Maldives. And the third explains the South Pole shoot. Flower Sequence "Deconstructed" (HD, 3:57) – Watch the flower- and FedEx-based sequence in realtime with the scoring, editing, shooting and scripting imposed over the final footage. Seeing Aviation for the First Time (HD, 2:49) – While shooting in Africa, an unexpected blustery storm rolled in that caused the crew to land a plane on the plains near the filming chopper. As soon as they touched down, locals came out of nowhere to see the upclose machines that they'd only seen from the ground. This video shows their reactions to be up-close to airplanes for the first time. Making of the Alaska House (HD, 4:46) – This feature shows the pure aunthenticity of the film's great sequence, showing just how many of our household items are international products. 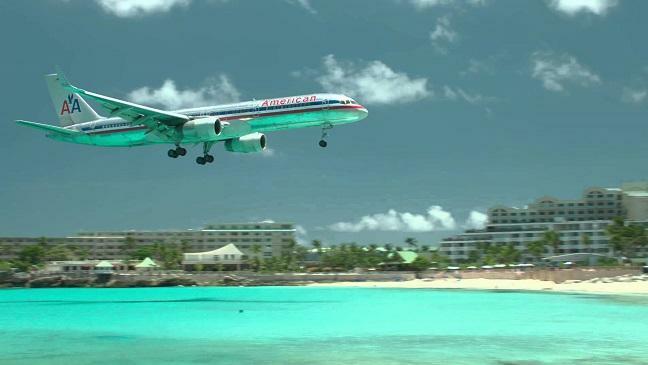 In-Flight Premiere (HD, 3:58) – The film's premiere occurred on a special Emirates Airline flight. This video briefly takes us there. For the James Horner fans, snippets from his premiere interview are featured here. Beware that most of these features are of a technical nature and were likely only included here as part of product placement partnering. The Future of Airbus (HD, 9:16) – Watch a long video that shows high-level details of Airbus' high-efficiency concept plane. The A320 Family (HD, 1:26) – Without dialog, walk through a CG rendition of the Airbus. Dream to Reality (HD, 3:17) – Watch a time-lapse assembly of an Airbus A380. The Super Hub (HD, 2:43) – In this cool featurette, learn about how FedEx Express' super-hub in Memphis functions. Meteorology at FedEx (HD, 2:21) – The carrier giant has its own in-house meteorology department. Learn how the weather forecasting helps them determine how to route packaging so it still arrives on-time. Why Memphis? (HD, 1:16) – This FedEx informational video explains why Memphis is the best place for their super-hub. Adaptive Cycle Engine (HD, 2:49) – Learn how GE's new high-efficiency engine works. GE9X First Engine Run (HD, :47) – Watch a climax-less engine test. GE Masterclass (HD, 2:06) – Like a Bill Nye video, learn about the science that makes GE's turbo engines run. When a film can spark wonder about a subject matter that has lost its luster, you know it's doing something right. 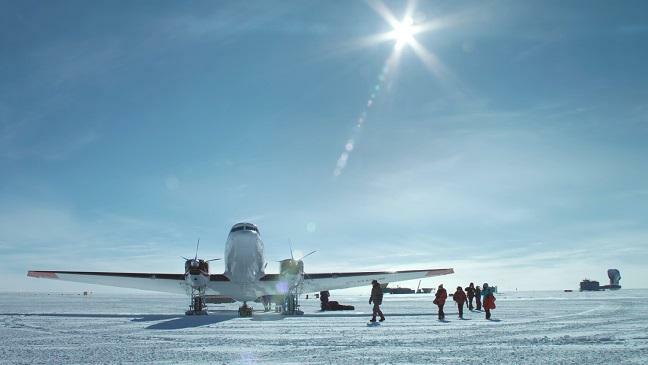 National Geographic's 'Living in the Age of Airplanes' does just that. Like massive special effects in blockbuster films, we've become numb to the amazing world of aviation and everything that's possible only because of it. 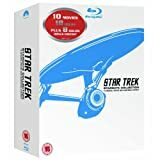 Popping in this wonderful Blu-ray and relishing in its gorgeous video and audio qualities - including James Horner's beautiful score - will revive an inner appreciation and love for flying.